As you can see wood changed its color to gray-brown. It almost looks like rotten. also changed its color and hardened. Since it had been absorbing too much moisture for a long time. 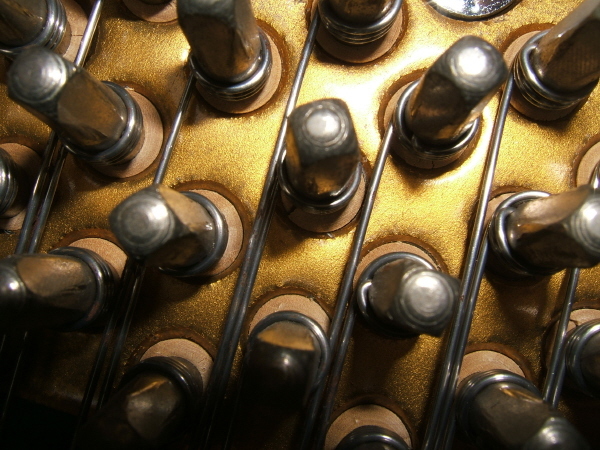 If you press the key with fortissimo,you will get a hammer-shank breaking sound. Keep this picture in your memory so when it is time to buy the piano. You can open the cap and see the inside to compare with it. If it looks like this color, I strongly recommend you to choose other one. Case 2: The piano which was opened to the public . It worn away.So now the wood hitting the strings. It is discovered most frequently and also most critically. These pins are usuallly longer than 5cm with delicate thread. And pinblock is made of specially seasoned laminate woods. But even though it was specially dried for a long time. It's wood. So as the time goes on it changes its volume as temperature and humidity changed. The picture above is due to exceed moisture and it expand pinblock's volume inside.woods squeezed to pin hole like toothpaste. so there is a vacancy between the pin and the pinblock. bad quality of the sound called "howling sound". 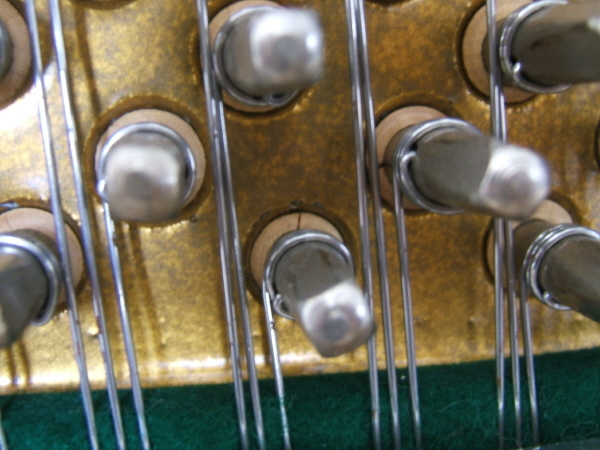 string and it takes long time and frequent tuning until the string stabilize its pitch. (3 or 4 tuning at least). The second alternative to that is to use the chemical treatment for it costs less. 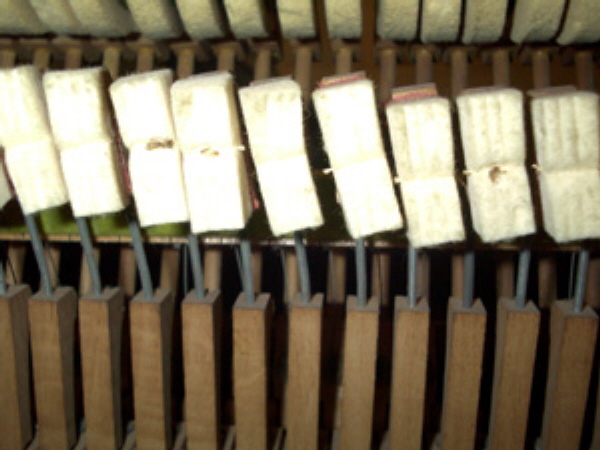 But this makes chemical bond between pin and wood so the wood may be damaged when next tuning. hide 2nd damage to sell it. The life of the Yamaha product is 2 times longer than others. The photographs below shows microscopic cracks. 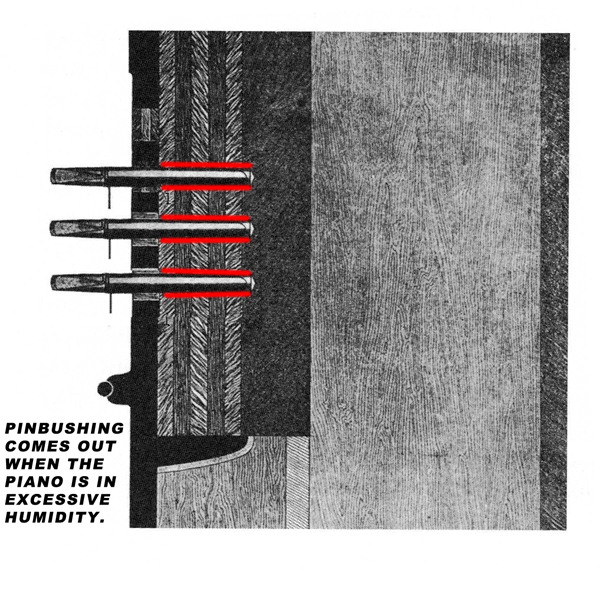 It can happen due to both lack of humidity or exceed of humidity. When these cracks became bigger inside. As you can see it become loose and impossible to tune it. Case 4: Rust on tuning pin,wire,string,hitch pin. Same condition on wire and string also. 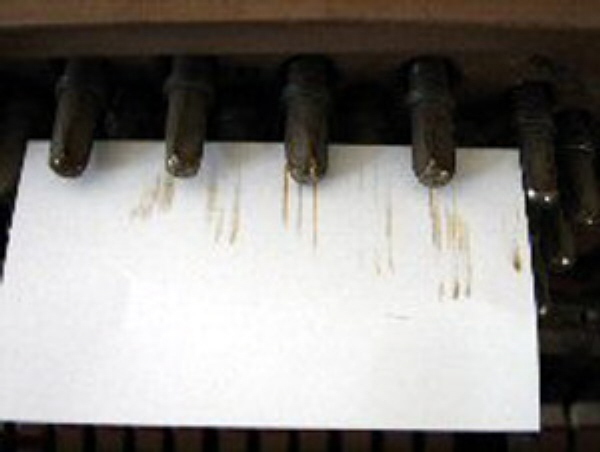 The percentage of the piano with the rust in canada is a lot higher than Korea. Analyizing this,main reason is on shipping process by the vessel. During one months(can be longer) shipping process. Dew condensation repeated on them. To prevent these thing from happenning. If the rust only started from the surface it can be recovered. But too much rust on bearing can be a reason of bad sound and disconnecting. 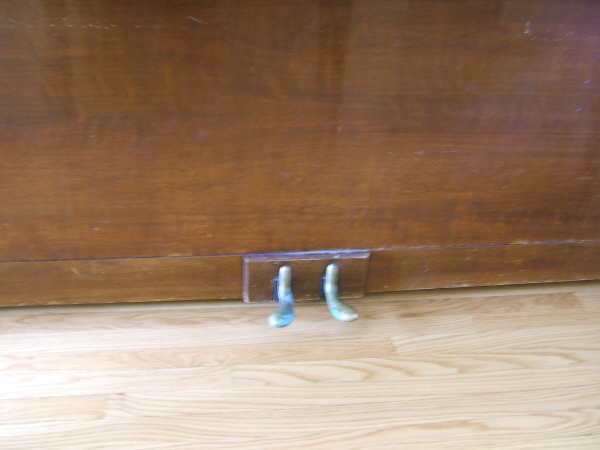 The photograph above shows space under"Ivory key antique piano"
It is not too hard to find mice's dung aroud pedal about 20~30 years old piano. In the case which key does not enter, return or slowly. There is numerous cause but there are three major reasons. 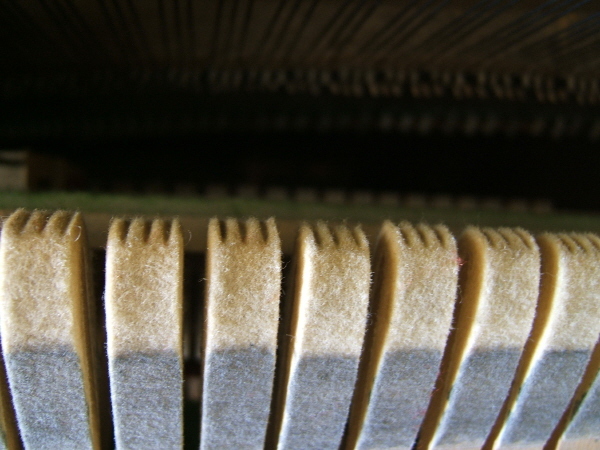 Foreign material insertion inside of the keyboard. It's not a matter at all only of it can be discovered and removed. ii) again it can be classified in 3 cases. 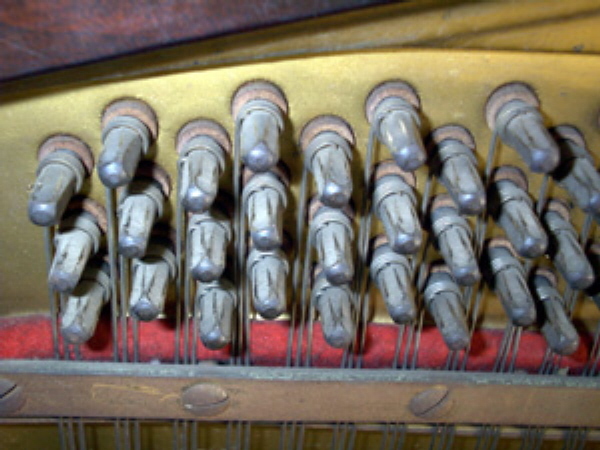 a) the balance rail pin which exists in the location 2/3 about of keyboard length (like seesaw) was bent by a strong shock to left,right,front,rear. Frequently happen to the piano which was left in cargo or storage long time. c) inflating of the felt by moisture located between balance rail pin and key If sometimes your key works smoothly and sometimes not. (Depends on daily weather) probably this is the main reason. Especially somebody spill coffee or water or coke over the piano. It absorbed to the felt and make it harden. Ofcourse it makes noise when ever you press the key. so corresponds badly to each joint region of inside action Too much friction inside.replace center pin and using the lubrication will be required. 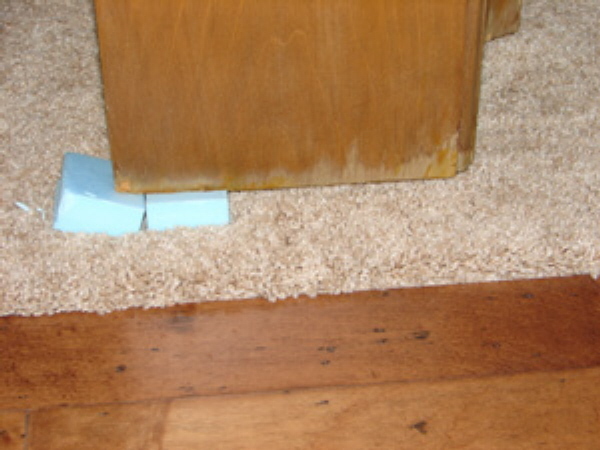 If it does not working after moving,usually the pedal rod was escapes from where it was it can be fixed in 5 seconds. The rod does not break easily. So don't be anxious to this. For usually it's age is over 80 years. (The hammer does not stop after hitting the wire. If you let it go. Soon the hammer will get away from the action and it will affect nearby hammer for escaped center pin will penentrate nearby center pins. It prevent vibration and resonance of that key. Can be fixed after adjusting the capstone block. As you see in video file above. The hammer will hit nearby hammer in motion. 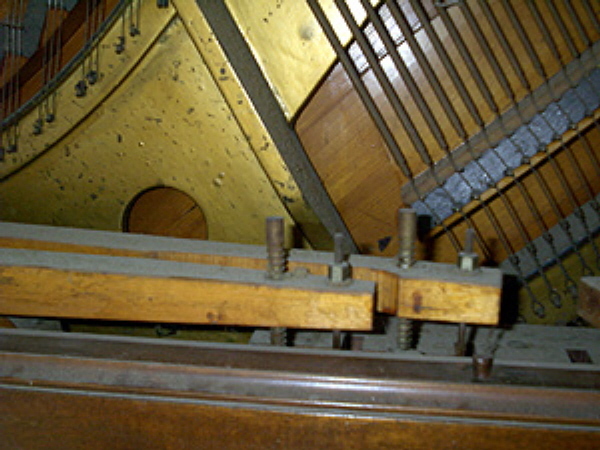 Case 8: After hitting the key, damper does not works properly.so endless resonance remain. 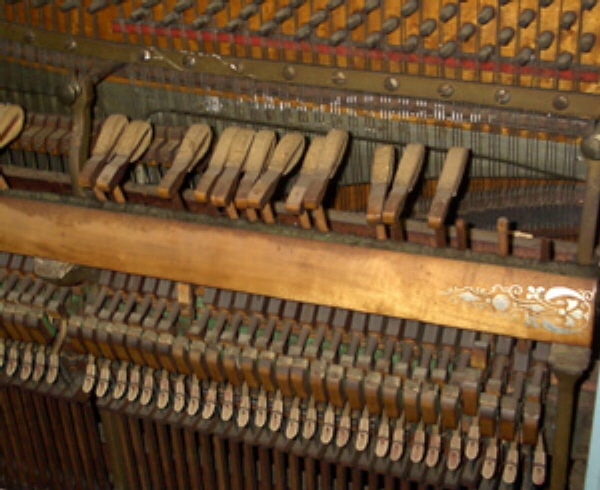 It is seldomly discovered from the piano which has been older than 60 years. It will sounds like as you press the sustain pedal . 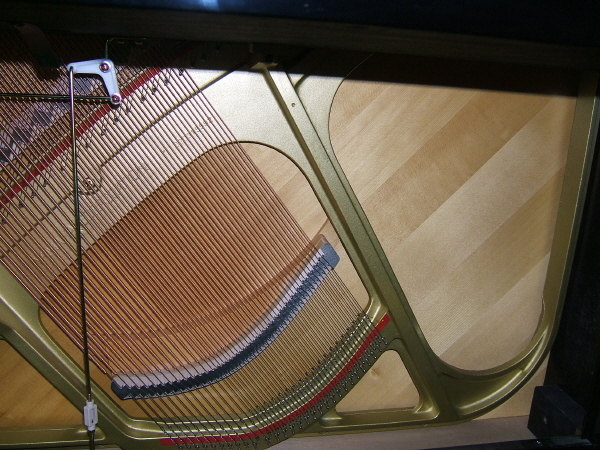 If the Side bottom is peeled off trace on the piano is usually made by the process of erecting up the piano to pass a narrow entrance. 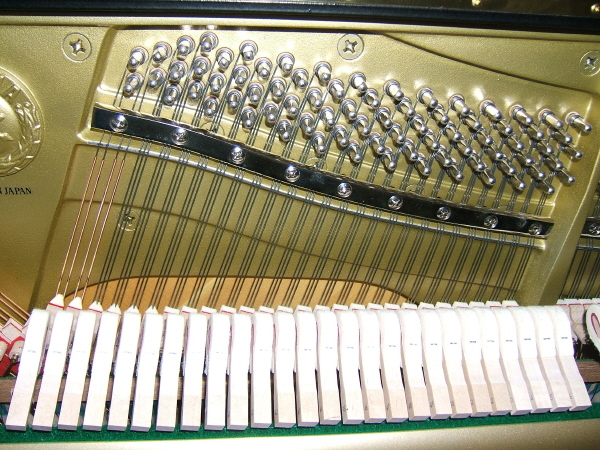 Skillful and delicate skill is required to move the piano without any damage. 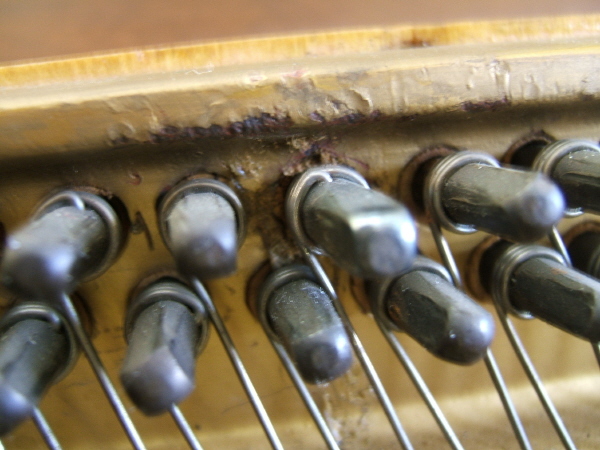 There's a high possibility the piano suffered inner damage for the shock from the outside. twisting and shrink or expand. Not to mention change of moisture,temperature. A string without distortion,without tension is nothing. Fortunately usually that starts from the highest-pitched tone area to the middle. Vibration is lost if theres no tension. (Usually the tension in one string is 80Kg and theres arount 200 strings in there. the total tension from tuning pin to bottom hitchpin through all the frame is 16 Ton. You will hear a loud striking sound instead of strings sound. Imagine what will happen if it lost its tension from middle tone area. It starts trifle cracks on the bridge. It is hard to distinguish changing of the sound only by hearing, it is almost impossible except expert. Below pictures will show you beginning and ending. Under this condition if you hardly played it during 10 years. Just put it under dry surrounding. One day you hear a striking noise instead of the vibration of string. The bridge became completely divided into two or three pieces. The only way to fix it is to replace it. You should release all the string before replacing it. And should carve new bridge nail the bearing pin again. Bond it. and put the new string again. tune it. 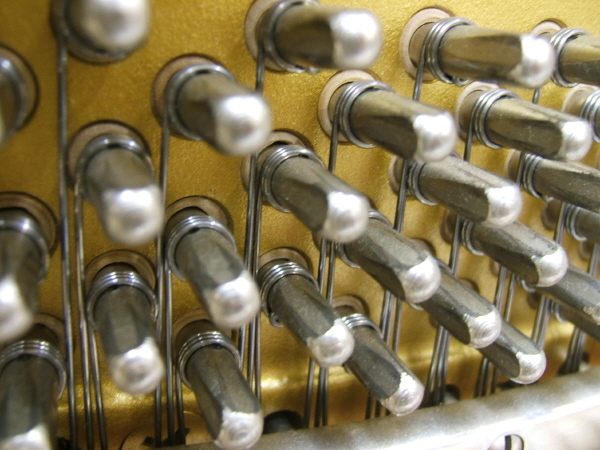 Isn't it sounds like making a new piano rather than fixing it? Don't buy the piano with cracks on the bridge that's all I can tell you. Additional information: What's the Buzz? ? The most frequent question from pianist or senstive player. When "Can't you remove this buzzing metalic sound by tuning?" No clear answer for this question. 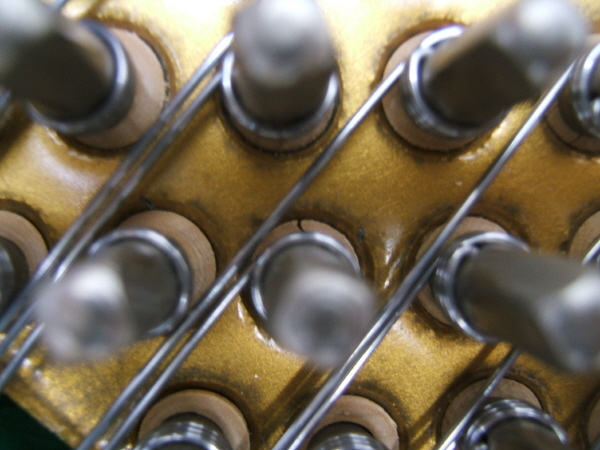 i) - it can be made from the frame or the pressure bar or the part of the wire between upper bridge to tuning pin. (Explanation: sparkling iron bar with 9 screw is the pressure bar. In this case there is no solution. The defect is the piano it self. These two movies is good example of buzzing sound. One for piano dehumidifier and the other for music board. ii) - All the material have its natural frequency. 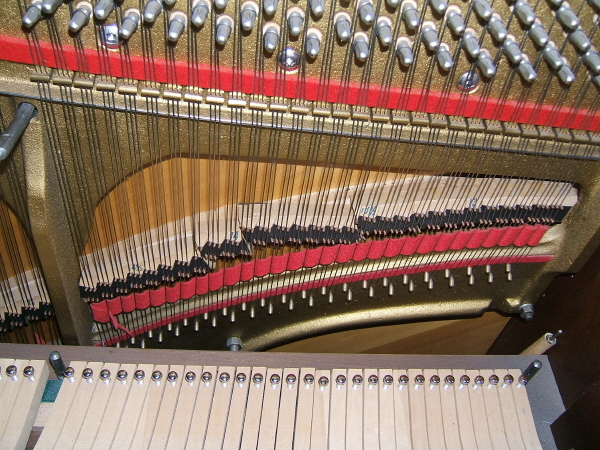 If the piano sound matches same frequency to the material around it. as long as you keep press the key. (to know more about resonance. The way how to finding it is something like this. And if you can hear buzzing on it. Press 2th octave C and if you can hear it either. If resonance between the piano and stuff around it ,is the main reason of buzzing, remove the stuff or moving the piano to other place. 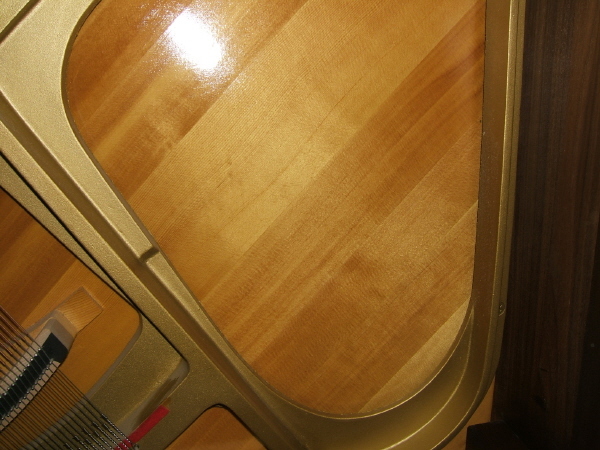 When buying a used piano,usually people check only outside and inside but not bottom inside.I mean the soundboard. 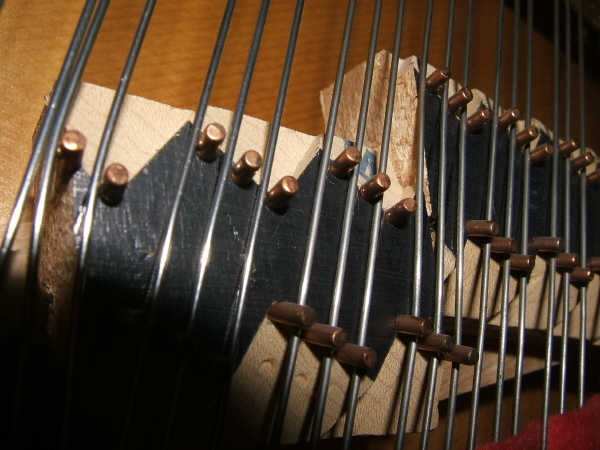 Those cracks in the middle of the soundboard makes weaken bridge bass's bond and move it slightly. Which makes buzzing sound. Just like guitar and violin. Soundboard is most important part of instrument. Who wanna buy violin,chelo,guitar with crack. But people frequently do when buying the piano. (One more tip: Also check surface of soundboard.Touch it with your palm. If you feel rough surface it means its dry and weak to damage. so don't erect it when moving or passing through narrow entrance. iv) - the adhesion of the bass bridge bass became weaken the metalic noise follows. 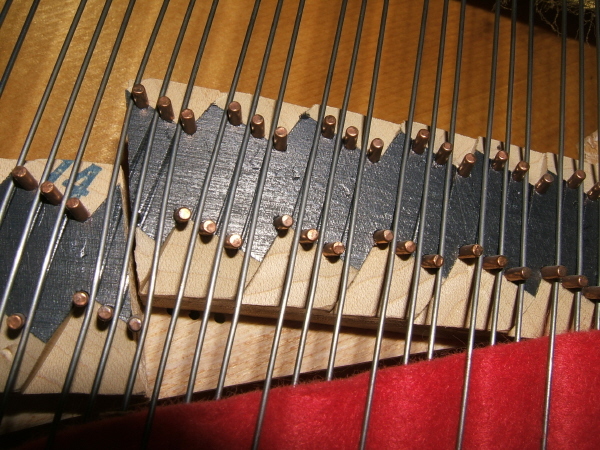 (Explantation: The woods with black color is the bass bridge.and the plate it was bonded is bass bridge bass. v) If the winding of the bass string became loosen. It can be a reason of buzzing. These are the main I can tell you. With career of many in this field with various experience. 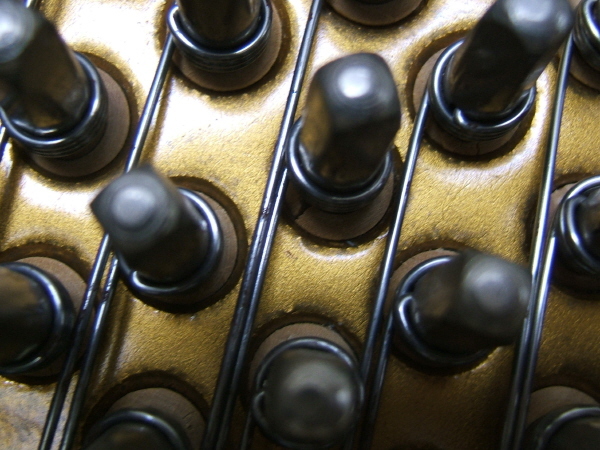 The pianos listed on Pianoinside.com tm passes all the defacts above information.Which means best of the best. 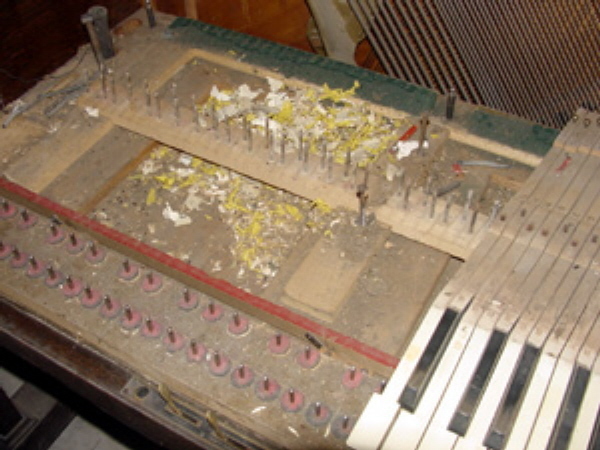 It takes over 10 years until the brand new piano became completely stabilized. And after 20 years possibility of defact realize as a malfunction. So to speak,if it woks perfectly after 20 years,it's already proven quality product. You can buy brand new piano but you can't buy 20 years test of time. informs me a joke with truth.Cannot be ignored. a lot of Friday component. We Pianiinside.com will guarantee you. Purchasing the used piano through us is the most wise shopping you can do in your life in Canada. Is not just one day,one weeks,one year. "Make customer can see what their grandchildren play with it." "Piano is not the furniture but the musical instrument"
6:45 p.m. -2006.4.28 complete writing contents. 5:50 p.m, -2006 9.24 complet correction impolite moods miss spells and weird expressions.